Most of the time we think of putting greens on golf course or outdoors in general. 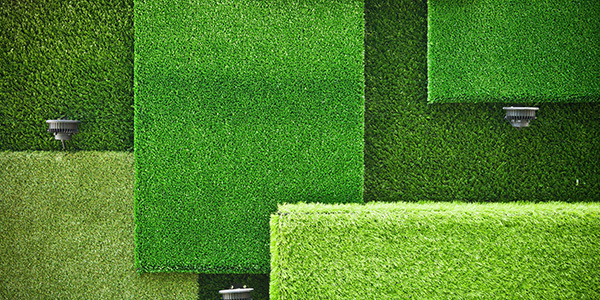 However, we have many customers that have installed putting greens inside their homes and businesses. Golf simulators are the new trend. We provide turf for indoor gyms as well as training facilities. In these locations, it is common to need prefabricated lines, ladders, dots and logos and GrassTex’s Aquafab department can provide them. GrassTex even has turf that designed for indoor soccer and football arenas. These indoor arenas allow for sports play year-round no matter the weather. GrassTex recently released its first healthcare specific turf, PT Turf™. PT Turf™makes the transition easier and better than ever when recovering from surgery or injury. Often time’s physical therapy is painful at best. With PT Turf, there is a higher level of comfort and support than with your standard flooring surface. Batting Cages/ Baseball Training facilities. We make home plate mats that create added comfort and support, but also protects the turf below. artificial grass, artificial grass saves water, artificial turf, grasstex, indoor facility, indoor training, Made in USA, synthetic turf, training.